When the 23-year old, Richmond, KY native, Arthur Moberly boarded a ship for Hawaii in 1945 to serve in the U.S. Air Force, he probably never dreamed that 60 years later his only great grandson would be of Asian descent. This weekend, my five-year old received special permission from the floor nurse to visit his great grandfather in the intensive care unit at the hospital. Now 91, Arthur is approaching his last days and the inevitable end of his physical journey. 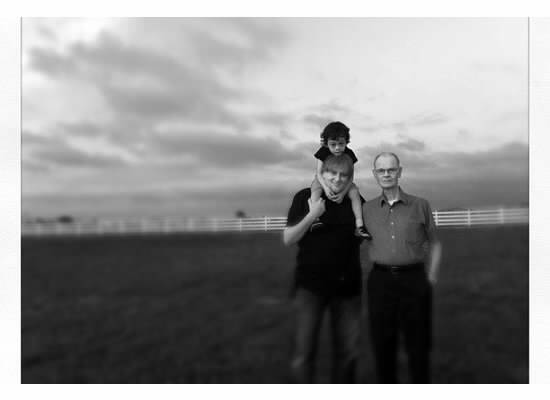 This picture of my son, my husband, and Arthur was taken at a July 4th family cook-out a couple of years ago. That day, I remember thinking about the beauty of our all-American blended Appal-Asian family, with Arthur's British ancestry now diffused with Thai lineage. As our remaining patriarch prepares to depart, I'm eternally grateful that my son had this time to get to know him, for he would not exist today without this man's mark on the earth.